Yarrow belongs to a group of plants that includes many perennial, drought resistant plants that will grow in almost any garden soil. Achillea filipendulina and Achillea millefolium are the most popular species and are both hardy in zones 3-10. 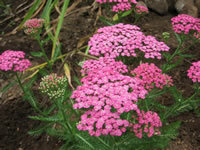 Yarrow plants bloom in June, and will bloom again in September if you remove the spent clusters of flowers as they fade. Common Yarrow has fern-like foliage that is usefull in flower arrangements as are the cut flowers themselves. but cultivars are available that produce white, yellow or red blooms as well. Achillea flowers attract many types of butterflies, but they may become an invasive weed if they are not properly controlled. Yarrow can be propagated by dividing established plants in early spring. Achillea plants can be easily grown from seeds sown directly in the garden in the spring or early summer. When starting yarrow seeds indoors, maintain a temperature in the growing medium between 65° and 75°. 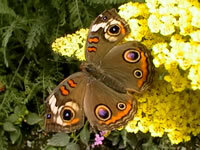 Yarrow seeds germinate in in as little as five days, but may take up to two weeks. Light is required for these tiny seeds to germinate, so do not cover them!.